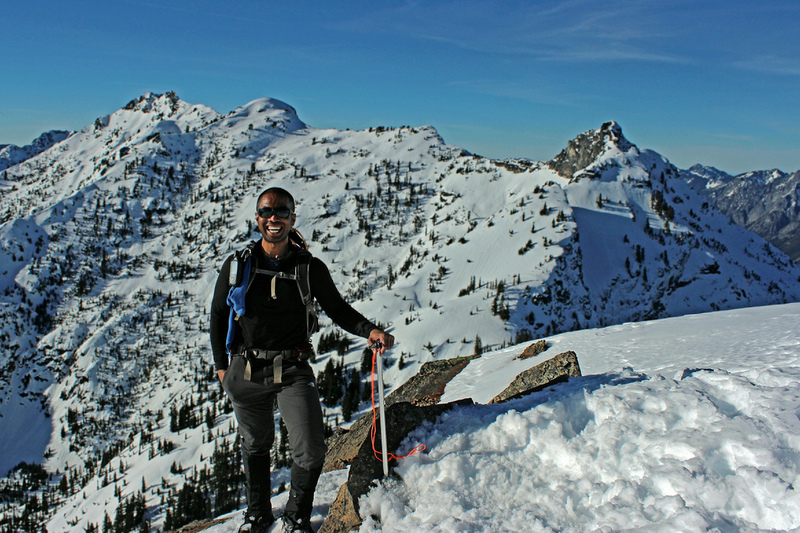 NOTE: Red Mountain by Snoqualmie Pass in the Alpine Lakes Wilderness. For Red Mountain in Salmon La Sac, check out these posts. A quick toss-up between Silver Peak and Red Mountain and the group settled on the latter. Views would’ve been gorgeous from any mountaintop no matter where we ended up. We mostly followed direction of the summer trail from the trailhead to bottom of the southwest ridge around 4,000’, which also marked the beginning of the aggressive elevation gain. The slope got even steeper at around 5,000’ and with a mixture of ice and crust. I personally brought crampons and they probably would have better served the purpose. But we all managed to get to the summit with just snowshoes and spikes. Ice axes were our best friends getting through sketchy sections both going up and coming down. Some cornices on the north face, so we all stayed close to the south rim of the summit. The exposed rocks provided a safe and solid place to rest our burning thighs and calves. Clear views all around with barely any clouds in the sky, even the distant Adams was visible. Yet another gorgeous day in the Cascades!